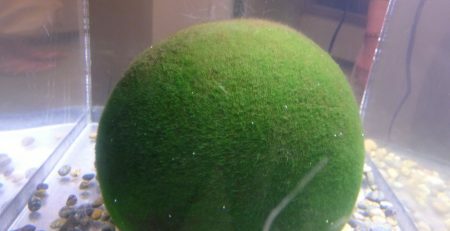 The Marimo Moss Ball, can be a fun and exciting addition to your fresh water aquarium. 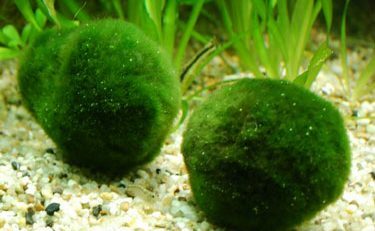 These balls of velvety green algae are a rare form of the Chlorophyta species. 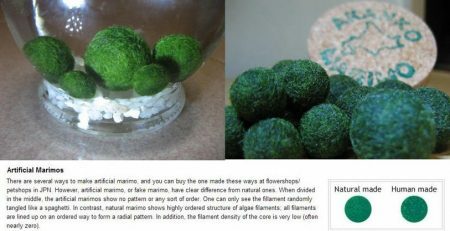 These spherical balls of algae are popular in Japan as pets, and, if cared for properly, are said to bring good fortune. They can either be kept in jars or cultivated in a community tank. They are known to form naturally in large colonies in Japan, Iceland, Scotland and Estonia. They were first discovered in the 1820’s and are wildly popular because for their natural spherical shape and fuzzy appearance. 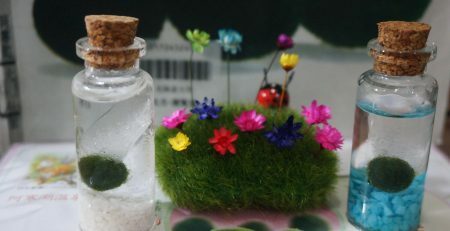 The Marimo Moss Ball can have a pretty long life. 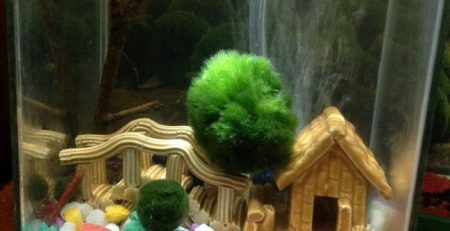 The longest living Marimo is said to have lived over 100 years! 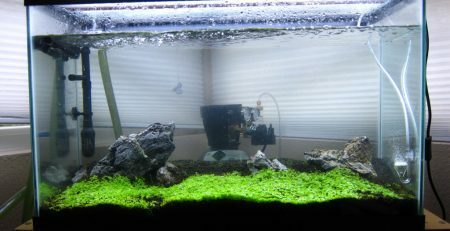 Marimo Moss balls can grow pretty large, up to about 20-30 cm in size. 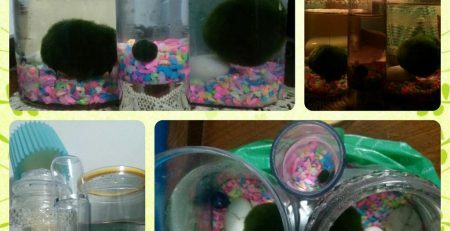 Their spherical shape allows for the Marimo Moss Ball to photosynthesize in low lighting. 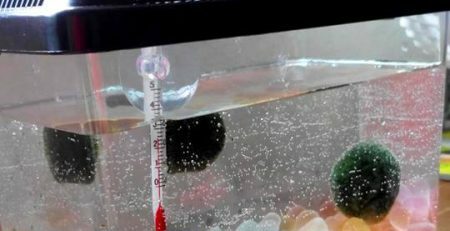 You can simply place the algae ball in fresh room temperature tap water, but the water must be replaced after 1-2 weeks. If the temperature of the room becomes above 25°C, it is recommended that you refrigerate them, but do not freeze them! They won’t survive! The water should be changed more frequently in the summer, and less often during the winter months. You can use club soda to help boost photosynthesis. The carbon dioxide in the club soda is great to increase algae growth. 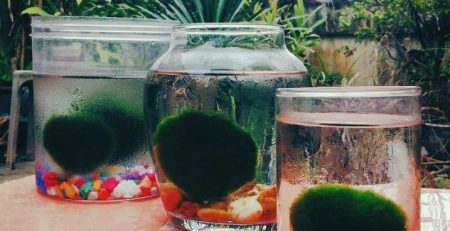 However it may harm fish and other aquatic animals, so be sure to remove the Marimo Moss balls from the tank before adding treating them with club soda. If your Marimo Moss balls change color, from brown to green, a little salt can be added to their water to aid in their recovery. 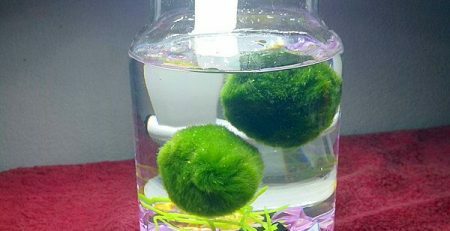 Marimo Moss balls also help in cleaning the water in your aquarium. If you want to add an aquatic plant to your aquarium that will aid in the cleanliness of your fresh water tank, these fun, fuzzy, natural filters are the perfect pick!